1st Item of Business: Yesterday was the 24th of October, otherwise known as The Smush's 7-month mark. Big boy! And what sass. 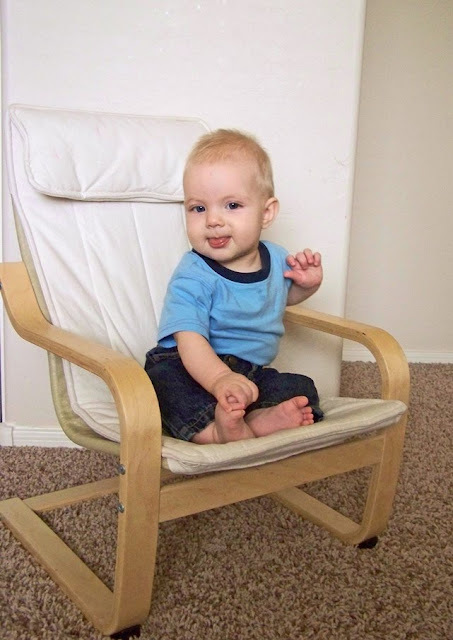 He can now sit up on his own. I know because I found him that way in his crib this morning. What a shock it was to see that little tow-head peeking up over the crib bumper. A cute shock, but a shock nonetheless. He's mobile, but I wouldn't say he crawls just yet. He pretty much just drags one leg across the floor, pulling himself along with his arms. But he gets where he wants to go. Thank goodness for baby gates. 2nd Item of Business: The sheer brilliance of IKEA. So, it's no secret I love IKEA. I love the style, the price, the atmosphere, the sensibility of its products. Oh, and the food isn't half bad, either. But now, I love IKEA for a whole new reason. They don't call it "magic" for nothing. Basically, if you're kid is 37 inches or taller (Bubby happens to be 39) and potty-trained (check! 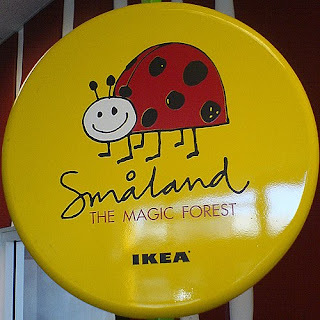 ), parents can drop them off for a whole hour at the amazing IKEA babysitting service known as Småland. And it's FREEEEEE. Maybe you've seen it at the bottom of the escalator, tucked safely into the corner. For years, I beheld its glory and pondered on the day I'd finally partake of its wonders. I mean, my kids. When my kids would finally partake of its wonders. Well, that time came on a blissful October 15. Dill had an eye appointment just across the street from Swedish Heaven so I decided we'd all go to the eye appointment and hit up IKEA afterward. It's about a 30-minute drive from our house so we don't go all that often. But if we're going to be in that neck of the woods, we stop. Mandatory. I can't be within 2 miles of it without getting sucked in by an unexplained magnetic force. I have no control over the situation. I am at the Swedes' whims. As we strolled up to the doors of the giant blue furniture Mecca, it dawned on me: My kid is unusually tall. Which means she's tall enough for Småland! A little fireworks show erupted inside of me. Dill was thrilled at this realization as well. A win for the parents. Bubby enjoys riding in a shopping cart about as much as I like shopping with a preschooler and a baby, but she LOOOOVES playing with other kids. Win for Bubby. And IKEA wins because you're more likely to buy their crap when you're not pulling our hair out and cursing your kids by the end of the shopping trip. So it's a win-win-win. Michael Scott would be so proud. Once I signed the rules form, Bubby ran into Småland in barefoot delight and we were off. Smush rode along in the cart as happy as a clam. Dill and I ventured upstairs to the café for some $2 breakfast which we savored. Then, like twitterpated newlyweds, we strolled leisurely through the store, noting how easy and fun it was with just one kid in tow. It was pure bliss. I didn't have to say "No" once the entire time we shopped. We wondered, Why the heck didn't we go more places when it was just Bubs to worry about? If you only have one child, you'd better take advantage of that and go out in public often. Like, every weekend. Because the more kids you add to the mix, the more circus-like your group becomes at places like church, the grocery store or IKEA, and the less you want to leave your home. Take my word for it. When our hour was up, I returned to Småland to pick up a happy Bubby. She had colored a picture of some weird rat and hedgehog. She said she played in the ball pit and watched a movie. She talked about it for days afterward. And so did we. And look, it's been more than a week and I'm STILL talking about it. And I know what you mean about the one kid thing! I drop Hayden off at school and I have one child for three whole hours. For the life of me, I cannot figure out why I couldn't get anything done with just Hayden at home! LOL, you guys are too funny! Glad you were able to partake of the awesomeness that is Smaland! Hopefully You'll get to do it again sometime soon! Yes I do my shopping on either M, W, F now as one baby is so easy compared to 3. Hi Jenna! First time I am actually commenting on your blog. I am coming out of cyber-stalkingdom. I am heavily addicted to Ikea and it's a good thing the closest one is half an hour south. Otherwise it would be a weekly trip for us!